The Paris attacks weren’t stopped by metadata surveillance. That hasn’t stopped officials from saying it might have. And yet intelligence officials and politicians are now saying it could have. They’re wrong. 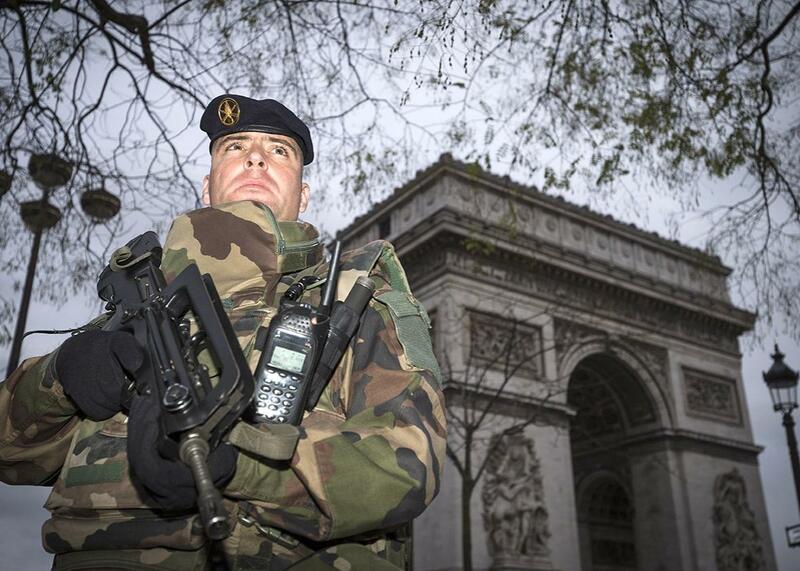 A French soldier enforcing the Vigipirate plan, France’s national security alert system, patrols in front of the Arc de Triomphe on Nov. 16, 2015 in Paris. Since terrorists struck Paris last Friday night, the debate over whether encryption prevents intelligence services from stopping attacks has reignited. The New York Times and Yahoo reported on vague claims that the terrorists’ use of encryption stymied investigators who might have thwarted their plans. CIA Director John Brennan made equally vague comments Monday morning, warning that thanks to the privacy protections of the post-Snowden era, it is now “much more challenging” for intelligence agencies to find terrorists. Jeb Bush piled on, saying that the United States needs to restore its program collecting metadata on U.S. phone calls, even though that program won’t be shut down until the end of this month. The United States and United Kingdom’s metadata collection that focuses on the Middle East and Europe is far more extensive than the phone dragnet being shut down later this month, and its use has far more permissive rules. This dragnet is mostly limited by technology, not law. And France—which rewrote its surveillance laws after the Charlie Hebdo attack earlier this year—has its own surveillance system. Both are in place, yet neither detected the Nov. 13 plot. This means they failed to alert authorities to the people they should more closely target via both electronic and physical surveillance. In significant part, this system appears to have failed before it even got to the stage at which investigators would need to worry about terrorists’ use of encryption. To understand why that’s true, it helps to understand how the metadata dragnet relates to surveillance of content as well as human spying. In most public comments going back to the initial leaks from Edward Snowden (and in Baker’s tweet from the weekend), authorities have made a shaky claim: that the surveillance dragnet is “designed to detect” an attack like Paris. Based on that claimed purpose, their dragnets are failing. But that claim was always an oversimplification. It oversold the importance of the dragnet, by itself, such that citizens might more willingly tolerate the collection of highly revealing personal details. Because it doesn’t include the actual content of our conversations, call metadata doesn’t seem especially intimate; if it’s the only thing authorities say they need to prevent a big terrorist attack, citizens might easily conclude that they’re fine with the government collecting it. But the claim also served to hide how quickly metadata analysis can lead to the reading of content. The intelligence community has given us a more nuanced understanding of the purpose of the metadata dragnet, however, in a National Academy of Sciences paper on “Bulk Collection of Signals Intelligence” released earlier this year. President Obama asked for the paper in early 2014 to assess whether the intelligence apparatus could accomplish what it currently does with metadata dragnets (both those conducted in the U.S. and overseas) via more targeted data collection. Contact chaining, which maps out networks of people based on whom they communicate or even spend time with. Identifying and keeping current all known identifiers (phone numbers, email addresses, device identifiers, IP addresses, Internet IDs) a person of interest uses. This is done, in part, by using algorithms to match up the communication patterns of different accounts. “Triaging” the identifiers collected to categorize the urgency of the threat to national security from the party associated with each one. If the dragnet accomplishes its purpose, it will provide a fairly comprehensive picture of who is communicating or hanging out with whom, connect all the known communications identities of any given person (which is critical to developing a comprehensive picture of someone’s network and the communications tools he uses), and then use those pictures to identify who poses threats that should be followed more closely. If the metadata dragnet works, that can happen even with encrypted communication. It’s only through that process that authorities get around to actually reading content. Authorities will use the metadata dragnet, for example, to choose what content to keep from bulk content collection. It’s likely they’ll collect, but maybe not immediately read, communications that are one or two degrees of separation from identifiers of interest just in case it becomes interesting later. Importantly, the NSA will even keep encrypted communications that, because of their metadata, are of interest. The metadata dragnet also helps the intelligence community decide whom to target in its bulky Section 702 PRISM collection, which last year affected more than 92,000 targets and everyone they communicated with. Here, rather than doing the bulk collection itself, the NSA capitalizes on the fact that much of the world uses American tech companies like Google and Facebook to conduct (and often, store) its online communications. So when the triaging process identifies new foreign identifiers that seem important, NSA can ask the tech companies to preserve and share on an ongoing basis everything that’s associated with that identifier, including more metadata. In most cases, NSA will get the content of communications those identifiers have, which they’ll read and store and pull up again in the future if a related identifier is involved. There are a few exceptions where officials cannot get the contents of communications via PRISM because they’re encrypted at the user level, rather than server level. The most important of these exceptions are WhatsApp and iMessage (and the latter only if users have opted not to use Apple’s cloud to store their communications), as well as any communications users have encrypted on their own. The NSA can’t get this content from Facebook, Apple, or other providers, but it can get metadata, so for users of interest, surveilers should at least know who is communicating with whom as well as some other useful details about them, though not what they’re saying. For WhatsApp and iMessage users of interest, as well as those using their own encryption, the intelligence agencies will seek ways to bypass the encryption, often by hacking a user’s device or identifying his IP address and then accessing other devices or Internet accounts using that IP. Importantly, however, it takes the triaging process or a particular event (like Friday’s attack) to identify users of such importance that the NSA will make the effort to conduct more targeted spying. Finally, there’s old-fashioned physical surveillance and human intelligence, asking people to spy on others. As reflected by the CIA’s recent decision to add a digital innovation unit, even old-fashioned spying is increasingly guided and assisted by communications technology, both in identifying targets but also finding ways and information to compromise those targets. Numerous declassified reports make it clear the FBI uses the American phone dragnet to identify people who might make useful informants. (It also sometimes uses communications content to find intelligence they can use to coerce that cooperation.) Presumably, other intelligence services do the same. For targets in a known location that are using very good communications security (by using encryption and ensuring their multiple identities cannot be correlated, not even with geolocation), physical surveillance of known targets (as several of the Paris perpetrators were by authorities) is always an option. The problem with that is it is very time- and labor-intensive—and because France and Belgium have so many potentially dangerous extremists, selecting whom would get that level of attention requires a very good combing process. It all comes back to this triage, which is in significant part about how well the intelligence community uses that forest of metadata to pick whom it should target. There are a number of reasons why the dragnet might not work as planned. Some important metadata may be missing, perhaps even from the PlayStation 4 consoles some terrorists have used to communicate, which Belgium’s Interior Minister said has posed particular problems in the days before the attack. (Though there’s no evidence PS4s played a role in this attack.) Some metadata, especially that scraped from content, may be increasingly unavailable if the content itself is encrypted. When individuals keep their online identities rigorously separate, that too makes the dragnet less useful, as it makes it hard to identify a terrorist network. Finally, it may be that the triage process doesn’t always measure the importance of communications effectively. In any case, news reports on the investigation into Friday’s attacks have suggested that some of the terrorists involved in the attack—even a figure identified as the possible planner—have had some of their communications analyzed already. If so, enough metadata was available to partially map out this network. If investigators know about these communications now, they could have known about them on Thursday, before the attack. And if they did, investigators might have been able to bypass whatever encryption the terrorists did use. The terrorists who conducted Friday’s attack may well have been using encryption. But if so, it appears that the metadata dragnet failed well before agencies got to any encrypted communications.